Notbit is a minimal client for the Bitmessage network. It is designed to work as a daemon with no UI. The idea is that it will store messages in the standard maildir format and accept new messages via a process like sendmail. That way it can be used with any compliant mail program such as Evolution or Mutt. The software is open source under a permissive MIT license. Notbit is a work in progress and currently has some limitations. It can already send and receive messages to regular addresses but it doesn't yet support channels or broadcasts. I am not a cryptography expert and I don't know whether Notbit or the Bitmessage protocol is actually safe for secure communications. I wouldn't recommend using for anything highly sensitive. Now you can run the installer with the following command. This will create three executables in ~/bin which is typically already in your $PATH. On some systems you may need to restart your terminal for it to work. If you want to exit the daemon you can type killall notbit. This will do a graceful shutdown. Once Notbit is running you can type notbit-keygen to create a new address. The new address will be printed on the standard out. The private keys for the address are saved in notbit's config files so you can immediately start receiving messages to this address. If you want to spend a bit of extra processing time in order to get a shorter address you can also pass the -z option to notbit-keygen. The ‘-l <label>’ option can be used to specify a label for the key. There are also other less useful options which can be seen in the help by typing notbit-keygen -h.
If Notbit receives a message for one of the addresses in keys.dat it will write it out in maildir format. maildir is a standard format which can be read by most mail programs such as mutt. By default the maildir will be ~/.maildir. You can change this with the -m option. Note that any messages you send must have the content type set to text/plain and can't contain any attachments. This means that HTML messages won't work. They must use either the us-ascii encoding or UTF-8. In the email address field, type an address generated using notbit-keygen. Don't forget to add ‘@bitmessage’ on the end to make it look like an email address. Select the bitmessage-maildir folder as the ‘Mail Directory’. 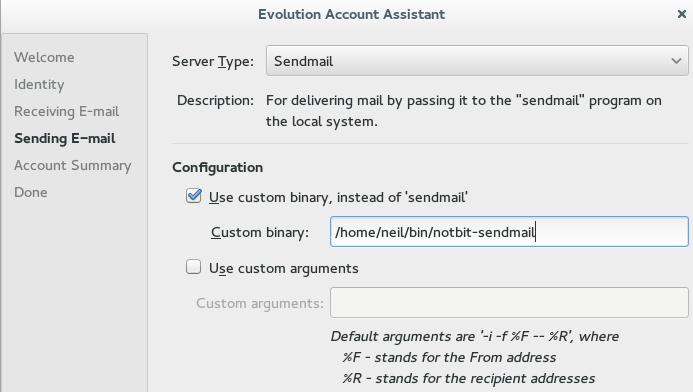 Under the ‘Sending E-mail’ settings, select ‘Sendmail’ as the server type. Tick the ‘Use custom binary’ option and type /home/<you>/bin/notbit-sendmail as the binary, where <you> is your username. The rest of the settings can be left at the default. 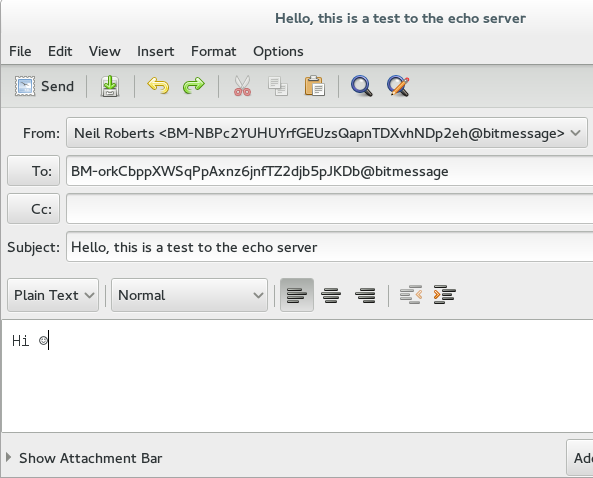 You should now be able to send a Bitmessage using Evolution. Just remember to add ‘@bitmessage’ to any address you send to and make sure you select ‘Plain text’ as the format (HTML emails and attachments aren't supported by Bitmessage). Don't worry if your name appears in the From box next to your address as this information won't be sent over Bitmessage. Only the subject and the body of the mail are sent. If you have any comments or suggestions for Notbit, please contact me on BM-NBPc2YUHUYrfGEUzsQapnTDXvhNDp2eh.